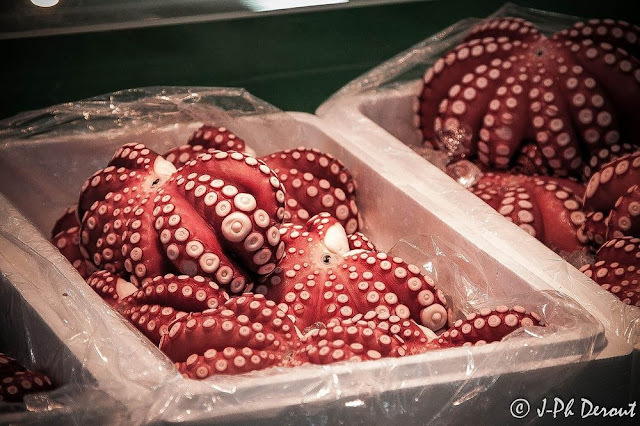 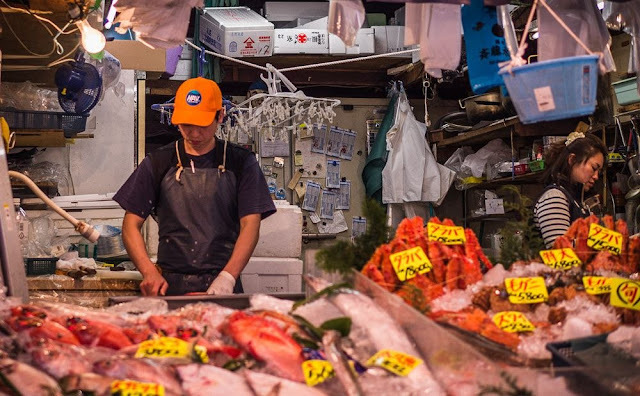 Sandwiched between Sumida River and the upmarket Ginza shopping district, in Tsukiji in central Tokyo, is a large wholesale market for fruits, vegetables, flowers and meat, but it’s fish and seafood for which Tsukiji is most famous for. 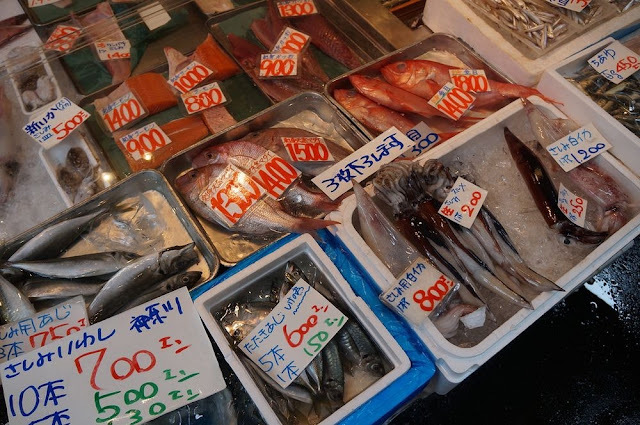 Everyday about 2,000 metric tons of seafood passes through the market everyday. 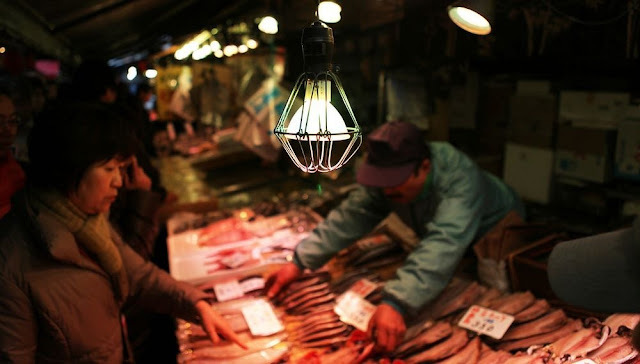 It is the biggest wholesale fish and seafood market in the world and also one of the largest wholesale food markets of any kind. 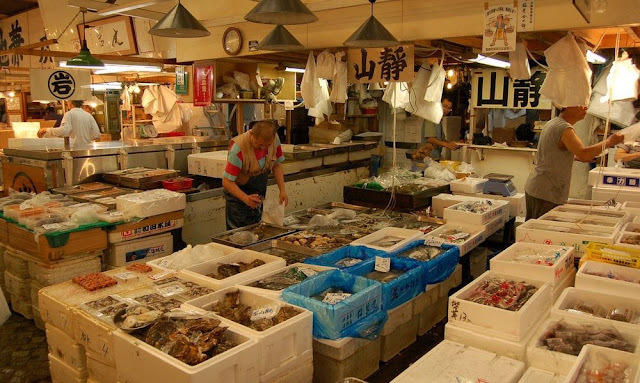 Tokyo’s earliest fish market, named Uogashi, was established on the bank of Nihonbashi River during the 16th century as a place to sell leftover fish that were not bought by the Edo Castle, the royal residence of the shogun. 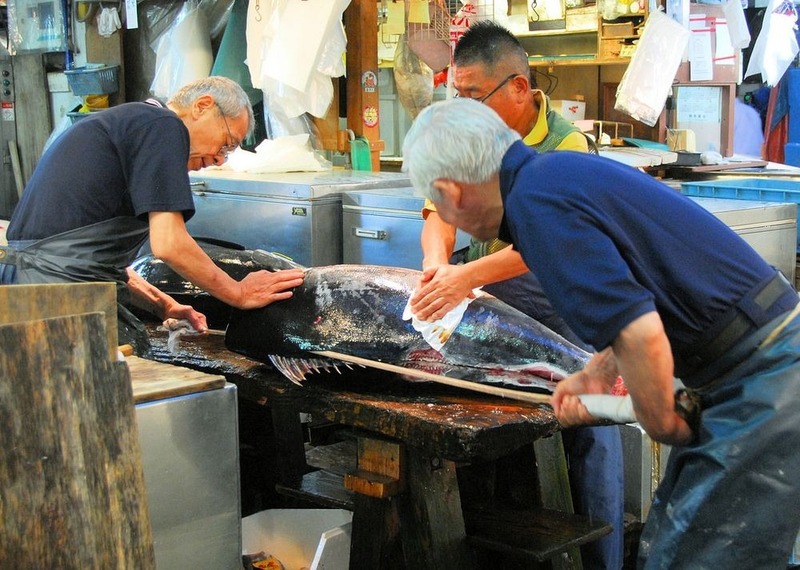 At that time, Tokyo was known by its former name Edo. As the city grew, so did Uogashi until it developed into a large-scale wholesale market. 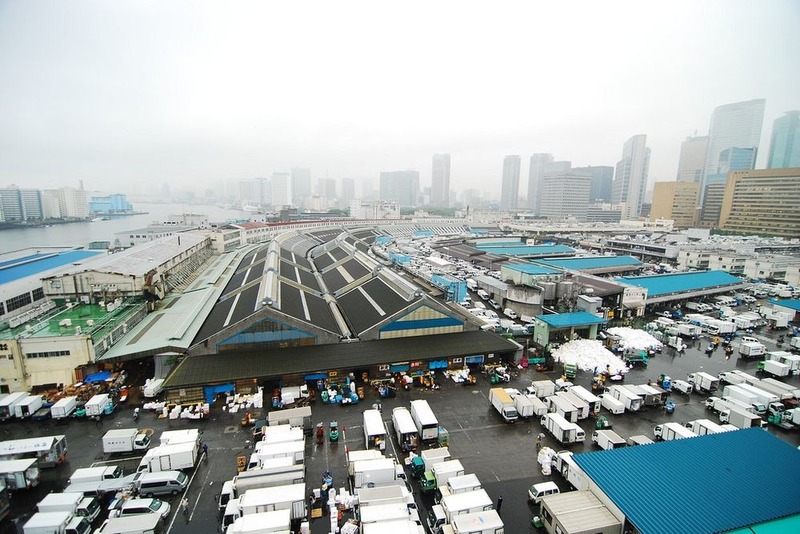 After the 1923 Great Kanto Earthquake devastated much of central Tokyo, including the Nihonbashi fish market, the market was relocated to the Tsukiji district. 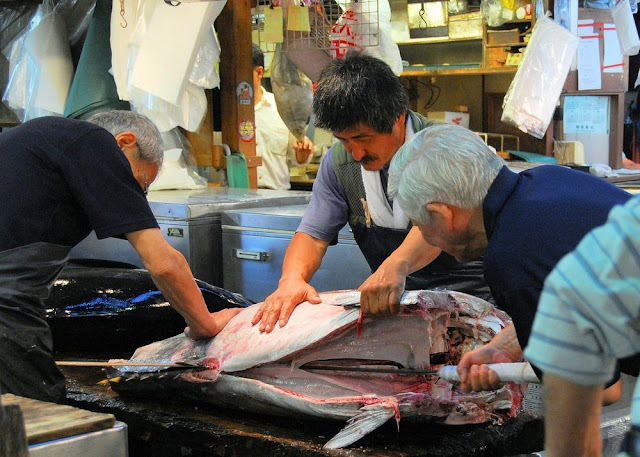 It began operating in 1935, and has since become one of the most popular tourist destinations in the city. 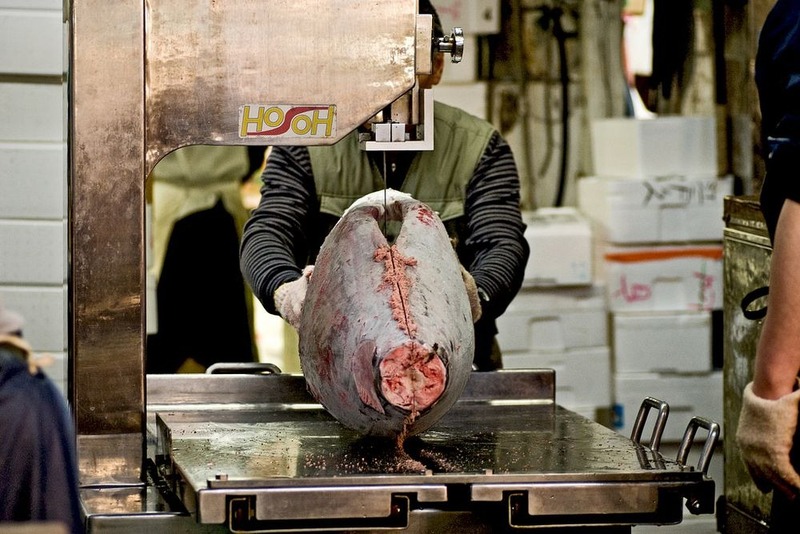 The most famous is the tuna auction where competition can drive prices upwards of several thousand dollars for a single fish. 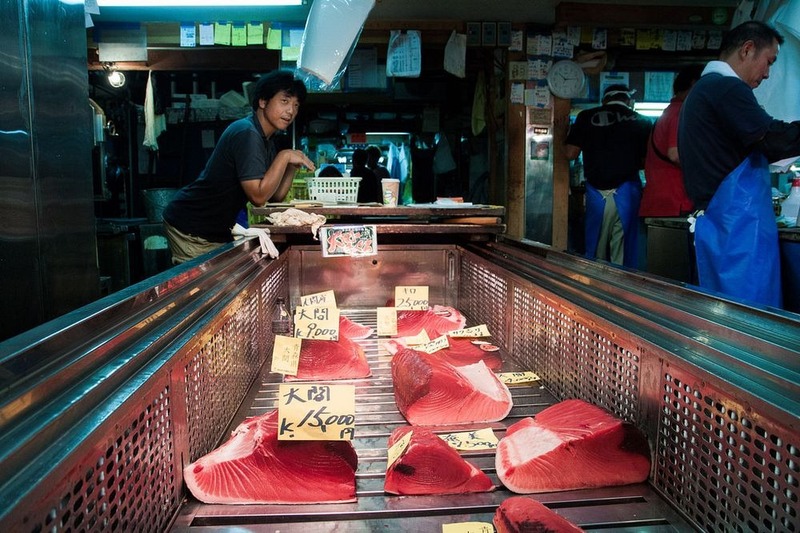 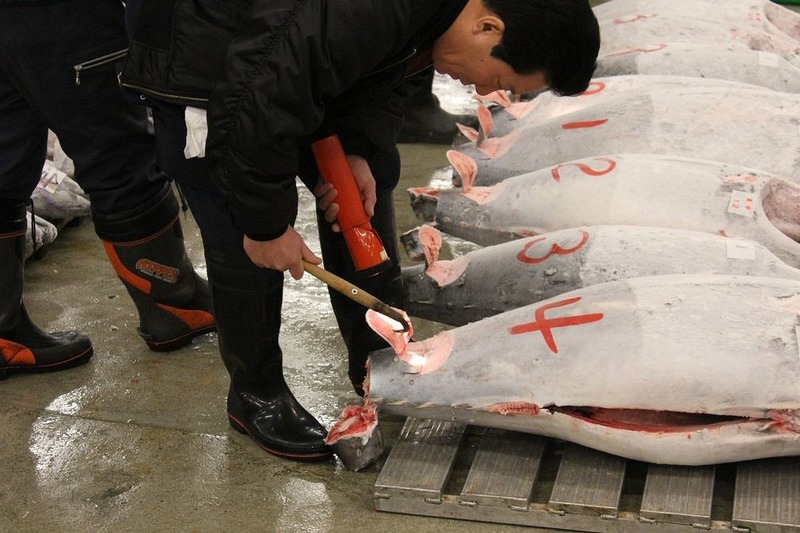 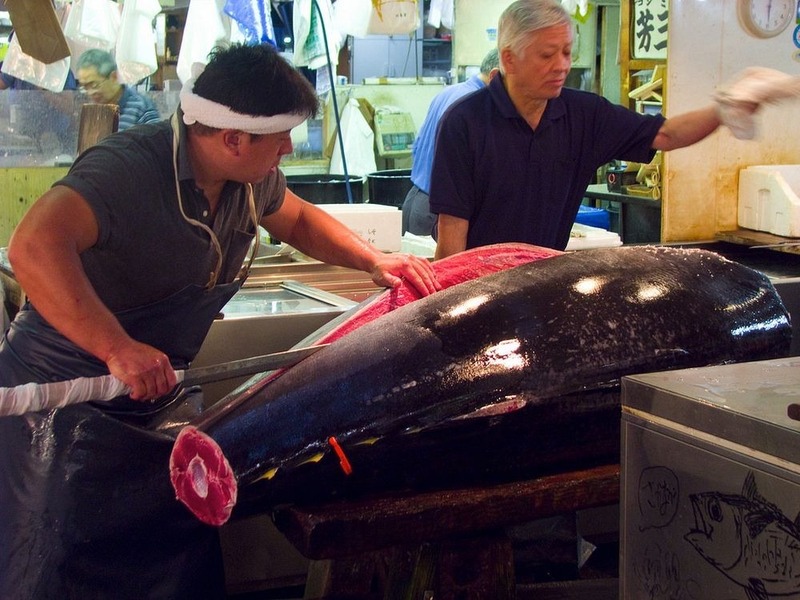 In 2013, a 489-pound bluefin tuna was sold for a a mind-boggling $1.76 million. The auction takes place in the “inner market” where only licensed wholesale dealers operate. 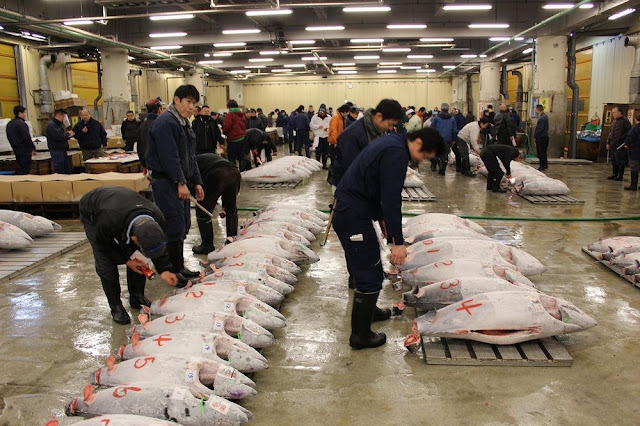 Visitors start lining up at 3 in the morning to be one of the lucky few who are allowed to see the auction every day. The “outer market” is open to all and is a mixture of wholesale and retail shops that sell Japanese kitchen tools, restaurant supplies, groceries, and seafood, and many restaurants. 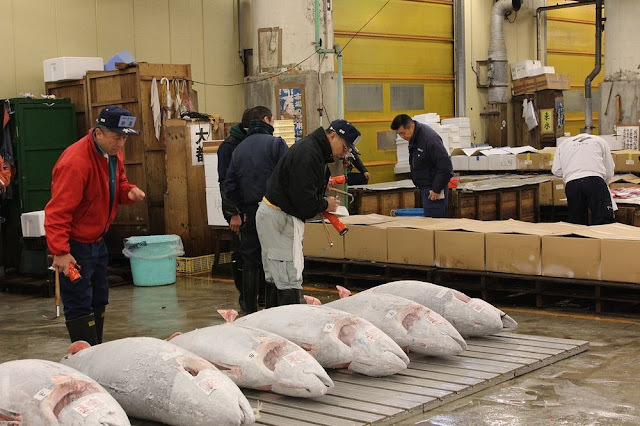 The auction begins at about 5:30 AM and ends at 10 AM. 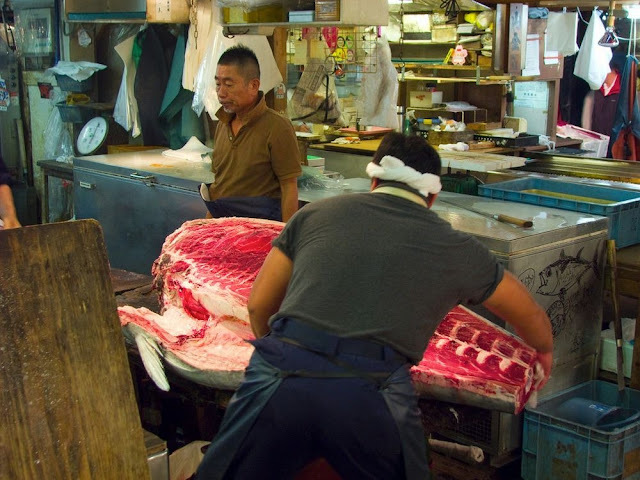 After the fish is purchased it is cut and prepared for retail in one of the many shops inside the market. For large fish like tuna, it is an elaborate process. 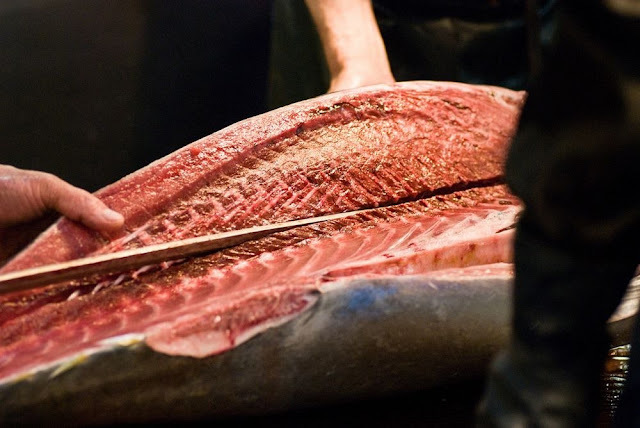 Frozen tuna and swordfish are often cut with large band saws, and fresh tuna is carved with extremely long knives some well over a meter in length. 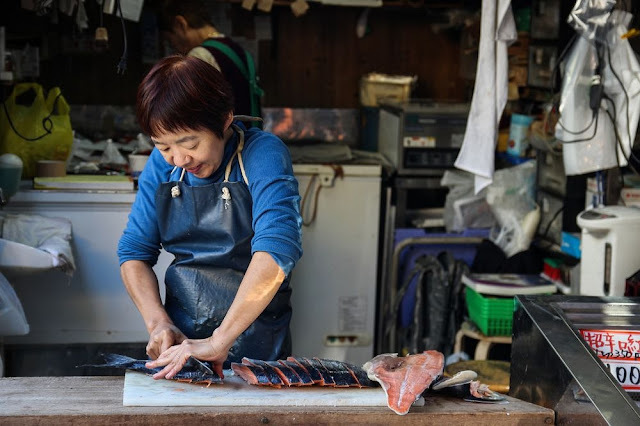 The Tsukiji fish market handles more than 400 different types of seafood from cheap seaweed to the most expensive caviar, and from tiny sardines to 300 kg tuna and even controversial whale species. About 700,000 metric tons of seafood worth 5.9 billion US dollars are sold here every year. Later this year, the Tsukiji market will be moved to a new destination on Tokyo Bay, to reclaim valuable real estate in Tsukiji. The city plans to lay a road through this area as japan prepares Tokyo for the 2020 Olympics.